2. Combine the oats, sugar, and flour in a large bowl. Melt the butter in a saucepan. Turn off the heat and stir in the golden syrup. 3. In a small bowl, mix the bicarbonate of soda with the boiling water before adding it to the butter mixture. Make a well in the centre of the dry ingredients. Add the wet ingredients, taking care to incorporate. 4. Form the dough into small balls between the palms of your hands and place onto the baking tray. Press them down; they won’t spread much during cooking. Bake for about 10 minutes or until golden all over. 5. Let the hobnobs cool on a wire cooling rack. Melt the chocolate in the microwave. 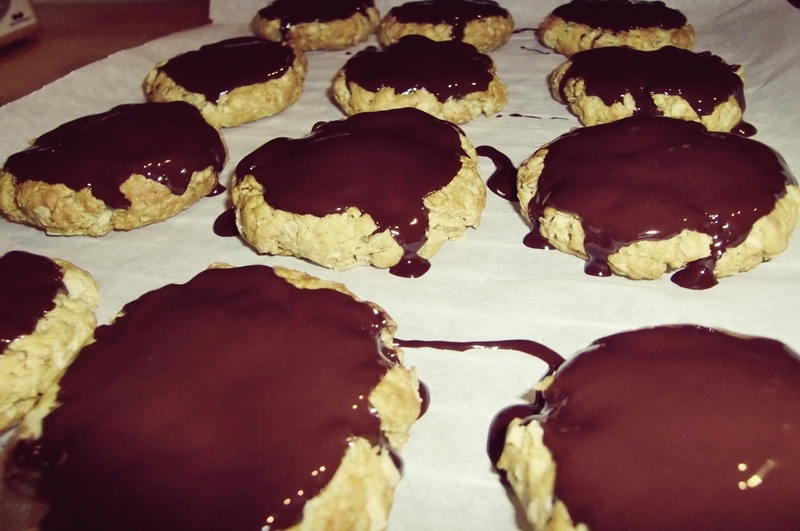 Use a spoon to generously spread the chocolate on the biscuits. Let the chocolate set before devouring.